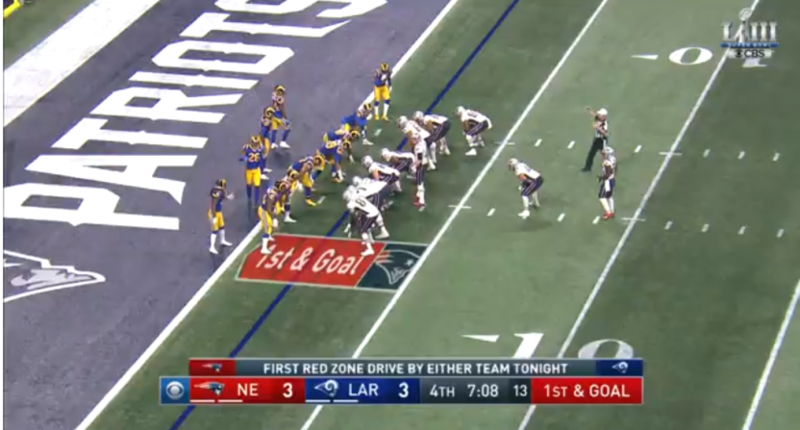 The New England Patriots and Los Angeles Rams met up in Atlanta for Super Bowl LIII on Sunday night, in what was expected to be a shootout. Oddsmakers had the over/under combined point total close at 56 points entering the game. Well, three total points were scored in the first half, and six total points were scored through three quarters. Six points through three quarters of play is the lowest in Super Bowl history. Previous record was SB IX – Steelers were up 9-0 after 3rd quarter. On the next play, Sony Michel ran for a two-yard touchdown. That would serve as the game’s only touchdown, in a 13-3 Patriots championship victory. Rams head coach Sean McVay has — deservedly — gotten tons and tons of praise for being an innovative offensive mind, but his squad was only able to muster three points and 260 yards on offense against Bill Belichick’s Patriots. Of course, running back Todd Gurley still didn’t appear to be 100% healthy and only ran for 35 yards on 10 carries. The defenses on both sides certainly deserve plenty of credit (particularly New England, of course), but this was generally an ugly football game — with no bad weather to speak of in a dome — and a total snoozefest to most viewers. In the end, the Patriots came away with their sixth Super Bowl title in the Brady and Belichick era, which is an absolutely ridiculous accomplishment.